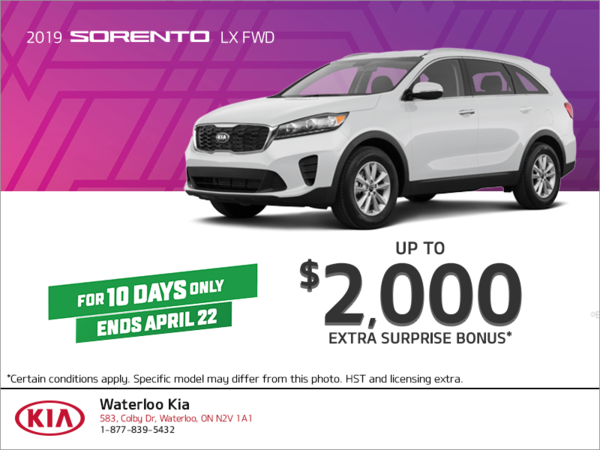 During the Kia 10-Day Sale, when you get a 2019 Kia Sorento receive an extra surprise bonus of up to $2,000! Offer(s) available on select new 2019 models through participating dealers to qualified retail customers, on approved credit, who take delivery from April 2 to 30, 2019. All pricing and payments include delivery and destination fees up to $1,785, $10 OMVIC fee, $29 tire fee and $100 A/C charge (where applicable). Excludes other taxes, paint charges ($200, where applicable), licensing, PPSA, registration, insurance, variable dealer administration fees, fuel-fill charges up to $100 and down payment (if applicable and unless otherwise specified). Other lease and financing options also available. Dealers may sell or lease for less. Some conditions apply. See dealer for complete details. Vehicles shown may include optional accessories and upgrades available at extra cost. All offers are subject to change without notice. AJAC is an association of prestigious professional journalists, writers, photographers and corporate members whose goal is to ensure factual and ethical reporting about the Canadian automobile industry. 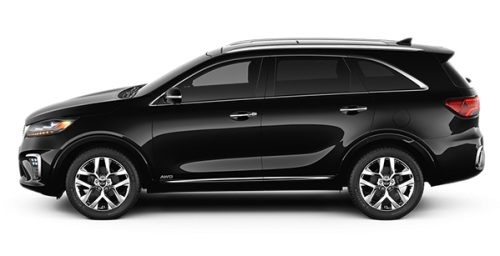 *Celebration Bonus is available on the purchase or lease of a qualifying new and unregistered model from an authorized Kia dealer in Canada between April 2 and 30, 2019. Celebration Bonus of $1,000 is available on the models as follows: 2019 Forte, 2019 Soul, 2019 Sportage 2019 Sorento, 2019 Stinger and 2018 Stinger. Celebration Bonus is combinable with other retail incentives and will be deducted from the negotiated price before taxes. No cash surrender value and cannot be applied to past transactions. Some restrictions apply. Please see dealer for full details. Offer is subject to change without notice. **Up to $2,000 Surprise Bonus is available on cash/lease/finance purchases of a qualifying new and unregistered model from an authorized Kia dealer in Canada between April 13 and 22, 2019 on select in-stock 2018 Optima and Stinger, and 2019 Forte, Optima, Sorento, Soul, Sedona, Sportage and Stinger models. Offer ends April 22, 2019. Surprise Bonus is combinable with other retail incentives and will be deducted from the negotiated price before taxes. No cash surrender value and cannot be applied to past transactions. Some restrictions apply. While quantities last. Please see dealer for full details. Unlimited roadside assistance is only applicable on 2017 models and onward. For more information on our 5-year warranty coverage, visit kia.ca or call us at 1-877-542-2886. Information in this advertisement is believed to be accurate at the time of printing. Kia is a trademark of Kia Motors Corporation.